While some business owners wonder, what is online marketing and how can I utilize it efficiently, others are already ahead of the curve implementing full-blown strategies that include content generation. Because content is still king online. Content is the key component of on-page SEO and acts as the foundation for everything else. All your other SEO efforts will be built off of the content. Without it the search engines spiders won’t be able to tell what your pages are about and therefore won’t know what keywords your pages should rank for. But it’s not enough to build out a website, create a few pages of content and let it just sit there gathering digital dust. Search engines love new content. New content gives the search engine spiders a reason to revisit your website over and over. It signals that you are actively managing your website and keeping it fresh. There’s also Google’s Query Deserved Freshness factor. This one search algorithm can affect up to 35% of searches. Basically, if a keyword is trending Google will look for websites that have recently published content on the subject. Those sites will get premium placement in the search engine results pages (SERPs) for a few days to a few weeks. The goal is to make results more meaningful and relevant for users by providing content that is fresh rather than stale and outdated. Another reason to publish fresh content on a regular basis is to take advantage of vertical search. This is when search engines run specialized searches focusing on a specific type of content, including news and local content. Need one more good reason for fresh content? Click on the search tools tab of a search engine and you’ll find a number of ways you can customize the search results. One of the top search tools is date. Many users want the latest information, and they’ll use the search tools to limit results. The fresher your content is the more likely it is to be found when users that search using a recent timeframe. You can’t just make a few updates to existing pages and re-publish them. 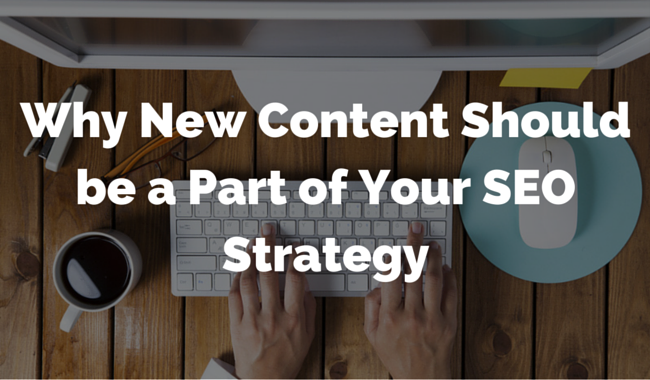 You can’t just continuously add new pages with little content or poor quality content. You can’t keyword stuff. Incorporate meaningful keywords in a natural way, and always add them to the headings, subheadings and URL. You have to focus on industry-relevant information that is trending. You have to focus on industry-specific news. You have to write with your audience in mind and what they want to know about. SEO isn’t the only reason content marketing has exploded this year. Marketers have read the eye-opening stats that prove customers want fresh, high quality content. Technorati found that blogs rank third in digital resources that guide consumer decisions. Another study from HubSpot found that businesses that have blogs are 13 times more likely to have positive ROI. Bottom line: Fresh content is an effective, affordable strategy for in-bound marketing that builds brand awareness in addition to SEO. Simply adding new content to your blog or website isn’t enough if you want to move up in the rankings. You’ll have to take the time to write content for people and search engines. The rule of thumb - when your content gets the interest of users it is guaranteed to get the interest of search engines. Every piece of content needs to have high quality, value-add information. You want to give site visitors content that they can’t find anywhere else. This is where your personal expertise and experience can shine. Use what you know to create unique content users can only find on your website or blog, and you’ll have the basis for an effective content marketing strategy. Educational and entertaining is the content sweet spot. If you can accomplish both of those in a single piece of content you have a better chance of keeping people on the page, getting them to share your content and encouraging them to promote your brand. These content performance metrics heavily influence both your ROI and your SEO.